Cd is the limiting value of the relevant serviceability criterion. 6.8.1.2 Where appropriate, allowance should be made for elastic shortening of the pile shaft under axial loading. In order to keep settlement to a minimum, it is common practice in the UK to limit the representative load on a friction pile to its characteristic shaft resistance (thereby discounting its base resistance). This is not a requirement of BS EN 1997-1:2004+A1:2013. In this context, the relevant serviceability criterion Cd in equation (82) is the shaft resistance of the pile calculated for ultimate limit state conditions. γs,SLS is a partial factor for shaft resistance in the serviceability limit state. NOTE The symbol γs,SLS is introduced here to prevent potential confusion with the value of γs used under ultimate limit state conditions. 6.8.2.2 The value of γs,SLS should be taken as a minimum of 1.2. NOTE 1 With γs,SLS ≥ 1.0, the settlement of an individual pile can be limited to less than 3% of its diameter, D; with γs,SLS ≥ 1.2, the settlement can be limited to less than 1.5% D.
the stiffness of the ground below the pile toe has been improved significantly (for example, by base grouting). 6.8.2.3 The design value of the compressive force applied to an individual pile at its serviceability limit state should be calculated from equation (69) with the values of the partial factors γF,i and γG normally taken as 1.0. 6.9.1.1 The structural design of pile foundations should conform to 4.8. 6.9.1.3 For the purposes of its structural design, the design value of the compressive force applied to an individual pile at the ultimate limit state should be calculated from equation (64). 6.9.1.4 The likelihood of some degree of eccentric loading on foundations consisting of only one or two piles should be considered. The piles should be designed to resist the bending which results or the pile cap should be effectively restrained from lateral or rotational movements. The restraint and the pile section or both should be sufficient to resist the moments due to eccentric loading or other causes. BS EN 1992-1-1:2004, 2.3.4.2 provides supplementary requirements for cast-in-place piles without permanent casing. These supplementary requirements involve reducing the diameter of these piles by 5% for the purposes of their structural design. This reduction is unnecessary when the execution of these piles conforms to BS EN 1536 or BS EN 14199. 7.5.2.5 Spacing of longitudinal bars should always be maximized in order to allow proper flow of concrete but should not exceed 400 mm. γC and γS are partial factors on the strength of the reinforced concrete and the steel reinforcements, respectively. the other symbols are defined for equation (85). 6.9.2.3 Values of γC, γS, αCC,pl, and kf should conform to the UK National Annex to BS EN 1992-1-1. 6.9.2.4 A cast-in-place pile (without permanent casing) that conforms to BS EN 1536 or BS EN 14199 should be considered to meet the «other provisions» specified in BS EN 1992-1-1:2004, 2.3.4.2(2). Therefore, the diameter used in design calculations of cast-in-place piles without permanent casing should be as given in Table 14.
the minimum number of bars should be no fewer than 4 (instead of 6, as stated in BS EN 1992-1-1). the clear distance between bars should be no greater than 400 mm (instead of 200 mm, as stated in BS EN 1992-1-1). 6.9.2.6 Depending on the type and magnitude of loading, a cast-in-place concrete pile may be reinforced over its whole length, over part of its length, or merely provided with short splice bars at the top for bonding into a pile cap. If a cast-in-place concrete pile is required to resist tensile forces, its reinforcement should extend over the full length of pile that is subjected to those tensile forces (including into any enlarged base, if necessary). 6.9.2.7 Reinforcement should be provided to resist tensile forces that might arise due to swelling of unloaded ground. In the temporary condition, it might be acceptable not to fully reinforce the pile. 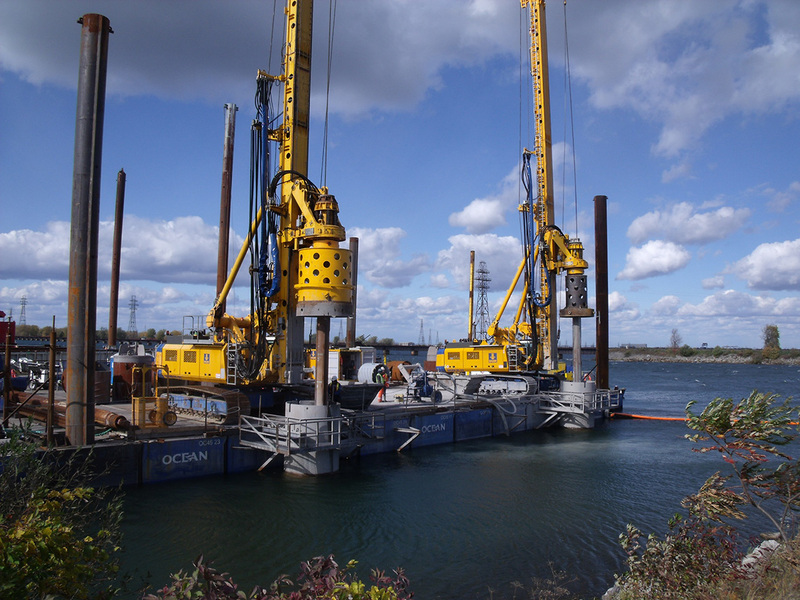 The structural design of driven cast-in-place concrete piles should conform to 6.9.2. The structural design of precast concrete piles is often governed by the stresses that occur during handling (lifting, stacking, and transporting) and installation into the ground. 6.9.4.1.1 The manufacture of precast concrete piles should conform to BS EN 12794. 6.9.4.1.2 Precast concrete piles should be designed to withstand the stresses that occur during handling (lifting, stacking, and transporting) and installation into the ground. 6.9.4.1.3 Lifting points should be clearly marked on all precast concrete piles. NOTE Guidance on the manufacture of precast concrete piles can be found in the ICE Specification for piling and embedded retaining walls, Sections B2 and C2 Driven pre-cast concrete piles (SPERW [N3]). The structural design of steel bearing piles is often governed by the stresses that occur during installation into the ground. Steel bearing piles should be designed to withstand the stresses that occur during handling (lifting, stacking, and transporting) and installation into the ground. NOTE Guidance on a suitable sheet pile section to withstand driving in different ground conditions can be found in the Piling Handbook . The structural design of helical steel piles should conform to A.6. NOTE Guidance on the design of timber piling can be found in BRE Digest 479 . But using some special drilling equipment (for instance produced by Bauer, Liebherr and Keller companies) it is possible to make even bigger ones – up to 3500 millimeters in diameter, up to 100 meters in length and up to 5000 kN in capacity.